Dr. Leonid Yurganov, Senior Research Scientist, JCET, UMBC, and member of AMEG, produced the above images with IASI/METOP satellite data (EUMETSAT). The images show methane levels for 2008, 1-10 November, and for 2011, 1-10 November. 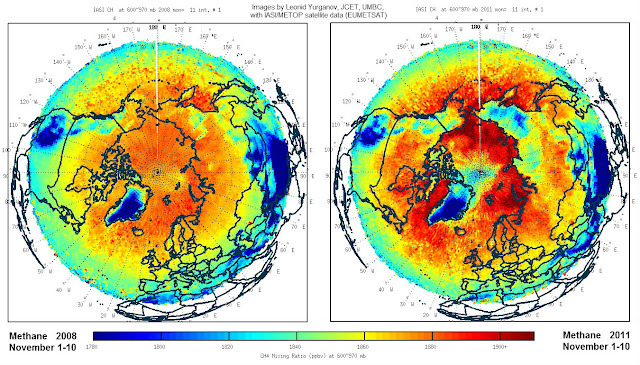 The images show a striking increase of methane over the shelf areas of the Arctic Ocean. For reference, the image on the right is added, showing predicted methane hydrates, as published by WWF with surface temperature hotspots added. 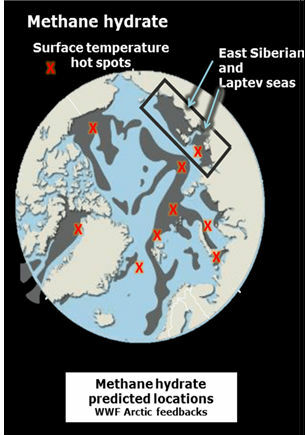 Dr. Yurganov points at the threat of large emissions of methane from clathrates (methane hydrates) in the Arctic, and urges others to support his proposals for further satellite methane monitoring. Current growth of methane is being monitored by the Atmospheric Infrared Sounder (AIRS) facility on NASA's Aqua satellite. Dr. Yurganov has been using AIRS data for years and points at an image he produced using AIRS data. The image shows that, during the autumn of 2011, the anomaly in the Northern Hemisphere was substantially larger than the anomaly in the Southern Hemisphere. Good post for those researching Arctic Metha ne Release. People really need to be watching this, it is the leading edge of a tsunami.